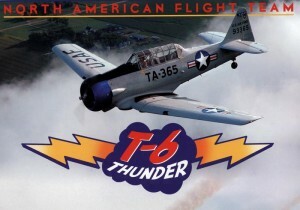 The “T6 Thunder Flight Team” is made up of 13 privately owned aircraft and 15 pilots from MN and WI who have been flying together for almost 20 years. We participate in air events in the 5 state region. The pilots flying today are Chuck Datko, Lead, Bruce Olson, #2 Gary Applebaum, #3 Scott Rumold, #4. All are from the metro area. The North American T6 was built as an advanced trainer in WWII. Over 22,000 were manufactured in Downey, CA and Dallas, TX. There are only about 300 left flying in the world today. The T6 is powered by a 650 HP Pratt and Whitney 9 cylinder radial engine. The gross weight on the aircraft is approximately 5500lbs. Top speed is 210mph. It has about a 750 mile range. They were equipped with bomb racks and 30 cal machine guns. The aircraft was used by 22 countries around the world as a trainer and fighter. When you completed you training in the T6 you went to the fighters and the front lines. It is said if you can master the T6 you can fly any prop airplane, and it’s true. The T6 was Used om WWII, in North Korea as a forward controller, and the early stages of the Vietnam War.